/weak female hormones engage/ I hope you don’t mind, but I’m using this as my desktop photo. I guess I change it every five seconds, but I still luffles it. This comic is definitely one of your best. Awww, shucks! Ain’t that just the sweetest/nerdiest thing! 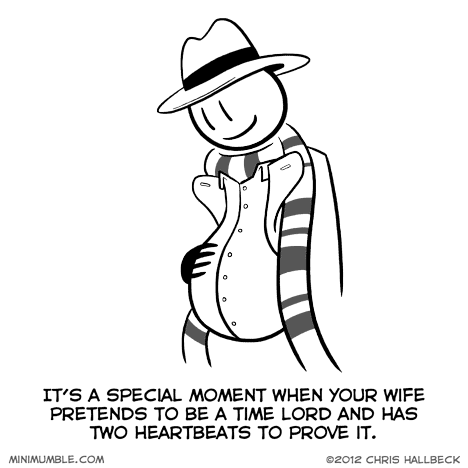 I’ve been reading through all the archives of Biff, Maximumble and Minimumble and this is without a doubt my favourite of all them. when I was little i swallowed a tiny toy that made a weird, heartbeat-like clicking sound for some reason. does that count? I hope you don’t mind, and I will remove it if you do, but I used this as my “baby announcement” on facebook! It was so adorable and I’m a HUGE Doctor Who fan!!!! Get me to a genetics lab and I’ll rig up a way for me to have two heartbeats!